Daniel is one of the first graduates of the Wheelchair Technologist Course (WTC) organised by TATCOT and Motivation at the KCMC Hospital in Moshi. Being a wheelchair user himself, Daniel knows like no other how to both use and build a wheelchair. In 2001 he started making wheelchairs together with Lucas. 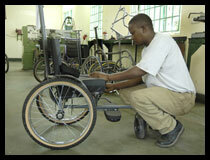 Lucas learned about wheelchairs when he and Emmanuel started their workshop in Arusha. Apart from his craftsmanship Lucas improved his management skills over the years. Nowadays he takes care of the financial and personnel management of MobilityCare. When Agnes applied for the WTC course at KCMC Hospital, she was asked about her job chances after graduation. 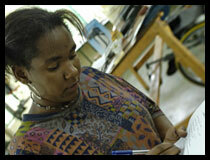 She then approached MobilityCare and was promised a job if she would have completed her training successfully. And so she did. 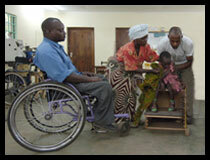 Agnes joined MobilityCare in 2004. Beat was recommended to MobilityCare by two European students whom he had helped to repair a wheelchair. 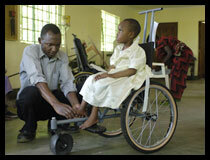 He moved from Mwanza to Arusha to join MobilityCare as a volunteer to learn about wheelchair construction. Because of his dedication to the work he was soon offered a job. Beat joined at the end of 2004.